The position and design of Villa Firefly really make the most of its wonderful countryside setting and views towards Agios Stefanos Bay. The living area, all 3 bedrooms and the poolside face the sea, and there's also a large private swimming pool and a fantastic dining terrace with BBQ. It's only 5 minutes' drive down to the resort which has several tavernas and shops around its picturesque harbour and beach. WiFi, pool heating and air conditioning/heating in the bedrooms are all included. The fantastic views of the sea and hillside from both levels of the house, plus it's only 5 minutes' drive into Agios Stefanos! Outside, Villa Firefly has a spacious sea-facing BBQ and dining terrace with wonderful scenic views. The terrace extends around the large private swimming pool, to the side of the house, where there is also space to sunbathe. The grounds are bordered on either side by trees for a good deal of privacy. At the front of the villa is a private and spacious, partially covered area for you to park your hire cars. Steps from here lead up to the entrance by the dining terrace. The open plan living area has 3 sets of patio doors along the front wall from which you can admire the magnificent views of the resort and down to the sea. On one side is a comfortable lounge with seating and a flat screen TV. On the other is a table and chairs and the fully-equipped kitchen. All 3 bedrooms, on the first floor, face the sea, with views across the water to the Albanian coastline in the distance. There are 2 twin bedrooms, one with an en suite bathroom, which share a spacious balcony at the front of the villa. The double bedroom has an en suite shower room and a private balcony with the same marvellous view. There's a separate shower room on this level, as well as a WC on the ground floor. This villa is registered and licenced by EOT Greek licensing association. This number is: 0829K1000388700. 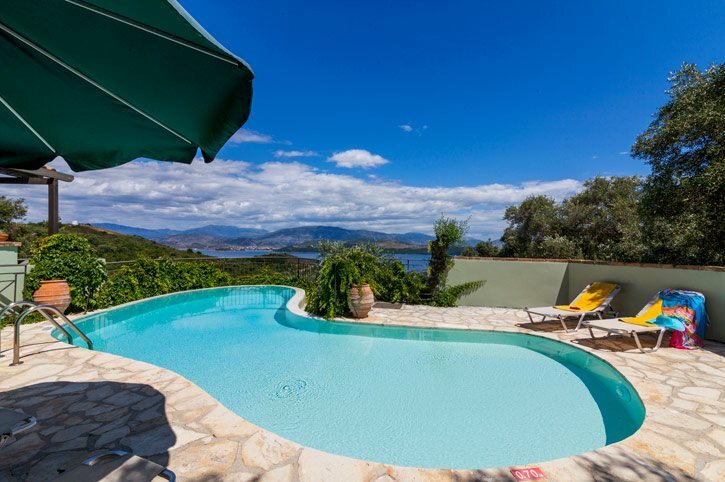 Villa Firefly is in a picturesque countryside setting, perched in the hills overlooking the resort of Agios Stefanos. It only takes 5 minutes to drive down into the resort which has several good tavernas and a few small shops centred around its quaint little harbour and beach. The resort has an easy-going atmosphere and plenty of Greek charm, and is surrounded on both sides by rolling hills and beautiful scenic countryside - perfect for a tranquil, relaxing getaway. There are 2 supermarkets in Agios Stefanos where you can stock up on food and daily essentials. In the opposite direction, going back to the main road, there is also a larger supermarket in Sinies Village offering a wide range of goods. Fresh meat and fish can be bought or ordered from all 3 for a family BBQ. Down by the waterfront is a good selection of tavernas and small cafes offering great food and lovely views over the boats bobbing in the harbour. The resort has a laid-back vibe where you can enjoy a relaxed breakfast, lunch or dinner. But if you fancy a change of scenery, venture a little further along the coast into Kassiopi, which has a much livelier vibe and several bars with a great atmosphere and Greek dancing! Agios Stefanos Beach is only 5 minutes' drive away. Although the beach is small and pebbly, it's still ideal for sunbathing, swimming and snorkelling. The beach merges with the little harbour just along the seafront and there are several good tavernas overlooking the beach where you can stop for lunch. The larger beaches of Avlaki and Kerasia are both within a 10 minute drive if you prefer. A horse riding centre, dingy sailing and boat trip facilities are all nearby and there is also a small water park, Hydropolis, approximately 9 miles away from Villa Firefly, in Acharavi - a great family day out! The bigger water park of Aqualand is situated in the centre of the Island in the village of Agios Giannis, approximately 22 miles away. There are plenty of things to see and places to visit in Corfu. The views from both Paleokastritsa and Mount Pantokrator are simply breath-taking. Or, why explore any of the traditional inland villages and enjoy lunch at one of their quaint little coffee shops? Plus, no trip to Corfu would be complete without visiting Corfu Town. Its lively market, authentic and high street shops, fortress and restaurants make it a great day trip. You can even stay into the evening, enjoying dinner and cocktails at the Liston - the main central building lined with bars and restaurants - as you watch the sun set go down over the marina. There is a golf course approximately 23 miles away in the centre of the Island, in the Ropa Valley, close to the village of Ermones. A great way to see more of the island is to hire a motor boat, which can be done locally, and explore the stunning bays of Kouloura, Kalami and Agni along the North East Coast. Water sports are also available, or, if you prefer to keep your feet on dry land, there is a horse riding school nearby offering treks through the beautiful countryside. Villa Firefly is not available to book for season as it is sold out. Take a look here at the Corfu villas that are currently on sale. There are 2 waterparks on the Island: Hydropolis on the outskirts of Acharavi on the north coast, and the larger Aqualand in Ag Ioannis, just outside Corfu Town. Both parks have a good selection of slides, pools and various refreshments available. Aqualand is by far the largest of the waterparks and in fact one of the largest waterparks in Europe with a big selection of rides and activities for all ages (including a very sedate 'lazy river' for older party members!) It has a couple of cafes and snack bars, a small shopping area and plenty of sun loungers and is open from 9am-8pm daily all Summer. Just on the outskirts of Corfu town is a 12 lane indoor bowling centre with a large games room downstairs. Open from 10.00-02.00 daily it is a great place for a family day or evening out. The highest point of Corfu and standing majestically overlooking the North East corner of Corfu, Corfu Town and the mainland beyond. One of the many beautiful driving routes on the island takes you up through several small villages including Spartillas, known (along with its sister village Lakones on the opposite coast) as 'the balcony of Corfu' because of its spectacular views. Follow on through Strinillas, one of the original hidden villages, built out of sight of the coast and therefore the marauding pirates of the time and up a narrow road to Mount Pantocrator the highest point on the island at 906 metres. There is also an adventurous drive from the North of the island, but this is best done in a four wheel drive vehicle. The last section of the road is better walked by the nervous but the fantastic panoramic views from the monastry and café, at the top are well worth the effort.